Serial killers are monsters in human form. Most are masters of disguise, appearing charming, affable, and glib. Ted Bundy was a law student with a bright future in politics. In his spare time, he worked the phones at a crisis hotline. John Wayne Gacy was an upstanding member of his community, a Jaycee, and a Democratic party candidate who once shook hands with Rosalynn Carter. Jeffrey Dahmer was such a smooth talker that he was able to convince police that one of his victims was really his lover. The poor tortured boy was returned to Dahmer’s custody, only to be murdered. One of the first-known American serial killers was H.H. Holmes, a medical doctor whose real name was Herman Mudgett. Holmes built a macabre murder castle in Chicago in the late 1800’s. Complete with stairways to nowhere, blind passageways, rooms with no doors, and false partitions, the house was an elaborate trap for his victims, who were gassed, suffocated, and tortured. A handy chute sent their bodies down to the cellar, where their flesh was removed with lime and acid. Their skeletons and organs were sold to nearby medical schools. 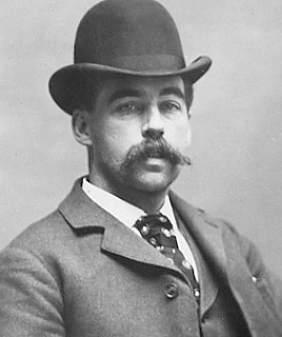 Holmes killed at least twenty people before he was caught, but estimates of his body count range as high as two hundred. The most famous “unknown” serial killer is London’s Jack the Ripper, followed by The Zodiac Killer. Serial killers are sociopaths–they have no conscience. Most kill out of an urge for power, control, and complete possession of their victims, and many are sexual sadists. Killing is the only way for them to get sexual release. Charles Manson is not actually a serial killer, although he’s often identified as such. He never killed or even helped murder a human being, and claims he had no part in the murders that landed him in jail. While he certainly influenced his sick family to kill in his name, he is closer to a deranged cult leader than he is to a serial killer. Aileen Wuornos is often identified as the “only female serial killer,” but this is not true. There have been many female serial murderers, including Amelia Dyer, one of the most prolific serial killers in history; Beverley Allitt, a nurse who killed at least forty of her patients; and Elizabeth Báthory, the Hungarian countess who bathed in the blood of servant girls. Many female serial killers are nurses who murder their patients. Murders once attributed to werewolves and vampires were most likely the work of serial killers. I have no proof, but I suspect Stephen King was inspired by John Wayne Gacy when he made the monster in his novel IT a clown. Gacy often entertained children at parties dressed as a clown (shudder). King admitted that the BTK Killer inspired his novella A Good Marriage. It’s a great story, but it pissed off Kerri Rawson, the BTK’s daughter. Many have something that keeps them from being able to fit in well with others during childhood–terrible skin, a bad stutter, anti-social tendencies, awkwardness, extreme height, etc. Most exhibit high intelligence. Edmund Kemper, who murdered his grandparents as a child and then killed several college coeds before slaying his own mother, is considered a genius. He is also 6’9. A lot of people turn their noses up at true crime, but in truth, it’s an art form, and very few writers do it well. The best help us understand what created the monster, while not celebrating him or her. They also memorialize the victims, which is important, so I will end this post with the story of Georgeann Hawkins. Georgeann was beautiful but tiny–she was only 5’2 and one-hundred and fifteen pounds. She was an exceptionally bright student at Seattle’s University of Washington, where she maintained a 4.0 grade-point average. She was also very social, and belonged to the Kappa Alpha Theta Sorority. On June 10th, 1974, she went to a party and had a couple of drinks. On the way back to her dorm, she stopped to say goodnight to her boyfriend, who lived just six houses down from her. She was a very cautious girl and rarely walked anywhere alone, but the street was well lit and usually busy. Many students were studying that night, so Georgeann wasn’t the only one awake at 12:30 a.m. She visited her boyfriend, borrowed some Spanish notes, and then headed for home. A friend called out of a window to her, and they chatted for a few minutes. She said goodnight and walked thirty feet away before he stuck his head back in through the window. Two other male friends remembered seeing her cover the last twenty feet before disappearing around the corner. She only had forty feet left to go. A man in a cast asked her to carry his briefcase to his car. When she agreed, he knocked her out, shoved her into his car, and sped away. She came to before he killed her, and in her confused rambling, said she had thought he’d been sent to help her with her Spanish exam. He knocked her out again, then pulled over and strangled her. Sadly, Georgeann Hawkins is most often remembered as a victim of Ted Bundy. If this post interested you, you’ll also like this one about the Atlanta Child Murders. Serial killers are definitely fascinating. Was Holmes the one who abducted people during the World’s Fair? I minored in psychology in college and took abnormal psychology. The class was packed…people are definitely interested in what can turn a normal person into a monster. I remember hearing that they’d found recently that the brain of a serial killer is different from other people’s brains? If they could figure out how to fix that difference, I wonder if they could somehow pinpoint this early and alter the person’s brain to be normal again? Yes, Holmes was the one who made sure that tons of people who came to Chicago for the World’s Fair never returned. I had heard that about the serial killer brain. Apparently, the portion of the brain that provides impulse control is smaller in a lot of these guys…but not all of them. Reading about Holmes made me shudder. Chelsea Cain has a series of novels whose main character is a female serial killer, which I found fascinating. I remember really enjoying the first couple of books. I’ll have to look into those books, Madeline. They sound really interesting, especially if Cain did pulled it off. The stories about Holmes are horrible. He was a consummate con man, and many of his victims got swept up in his schemes, not realizing that they were actually the targets of his diabolical plans. One man, for instance, agreed to pretend to die in a lab accident so his family could split the insurance payout with Holmes. Holmes was to disfigure a medical cadaver and pretend it was this man, but instead, he simply killed him for real. When the man’s wife kept wanting to know where her husband was, Holmes somehow convinced her to let him take her children for a few days. Then he killed them as well. Knowing that there are people out there always creeps me out. My male friends don’t understand why I refuse to walk alone after dark… You only have to get unlucky once. Also, I wrote about Báthory on MopDog under M earlier 🙂 She is remembered as a serial killer, but most likely she was innocent. Hmm…I’ve never heard any claims that she was innocent before. That’s a new one for me! Men will never understand all the precautions that women have to take in the course of daily living. I don’t know why or what it says about me, but serial killers are fascinating. They do horrible, unthinkable, inexcusable things…but their behavior and definitely the big “why” is something I think about a lot as a writer. I read a book about Ted Bundy once. He was said to be so charming but was a real monster. Bundy definitely fooled a lot of people. One of the women he worked with at the crisis line was a police officer named Ann Rule, who became famous for her true-crime books. “The Stranger Beside Me” was her first book, and it’s about her dawning realization that her trusted friend was a serial killer. Ed Kemper used to hang out with cops at a local bar. They called him Big Ed and liked him so much that when he tried to turn himself in, he had trouble getting anyone to believe him. Takes a sick person to kill people like that. Agreed, Alex. Sick, but not legally insane. Serial killers know right from wrong, and most take a lot of precautions in order not to get caught. Interesting topic for “S” day. I think too often people expect serial killers to look like killers, and not like these seemingly normal, charming people. That’s part of the problem, Nadine. I’m hoping this post will educate someone…maybe even save a life. One of the first known female American serial killers was Belle Gunness. Her first husband died mysteriously on the only day both of his insurance policies overlapped. Her two children with him died. Her second husband’s child died alone in her care. Her second husband died when a meat cleaver fell off a shelf and split his head open. She advertised in lonely hearts magazines, imploring the men to tell no one they were coming, cash out any bank accounts and sew their money securely in their clothes. They were never seen around LaPorte, Indiana again. Eventually, the brother of one missing man became suspicious announced his intentions to investigate. The night before he was to arrive their was a mysterious fire at the Gunness house. Four people were found in the basement. Three were her children and one was a woman with no head or feet. The police started digging around the pig pen (which had a six foot fence topped with two layers of barbed wire – just in case pigs can fly, I guess), they found many body parts. They dug up four people, including the man’s brother and Gunness’s foster daughter – in the back yard. There’s no telling how many people she killed. Currently, they are trying to find out if the headless, footless body buried in Forest Home Cemetery in Forest Park, Illinois is in fact Belle Gunness. More likely, Belle escaped and died under the name Esther Carlson while Esther was in a California jail awaiting trail for killing her employer. Thanks for your comment, Karen, and welcome to my blog! Hope to see you back here. I’ve seen a few documentaries on Belle. She was pretty nasty, to put it lightly. There’s fascination and repulsion at the same time. I suppose that’s because most “normal” people need to make sense of the inhumane acts these people who share the planet commit. I read Devil in the White City and the scenes in that book with Holmes were almost unbearable to read. Maybe I reacted so strongly because what he was doing was juxtaposed with the World’s Fair and all the amazing accomplishments by Daniel Burnham. Two brilliant men: one a monster, the other a creative and inspiring builder of something beautiful. H.H. Holmes was definitely a monster, but you have to admit he was extremely creative as well. Who else on earth has built a “murder castle?” His con games and weird inventions were quite brilliant. Thankfully, people like him are very few and far between. I feel the same need to make sense of horrible things. Serial killers are my favorite subject to read on. They are fascinating and horrifying. I just finished a book on serial killers that had a few I didn’t know about. It’s too bad that despite all we know about serial killers, we can’t stop them sooner. It’s always after the fact that we see how the person becomes one. So true, Patricia. Unfortunately, most of these people are so intelligent and so great at acting “normal” that even when there is early intervention, it never goes far enough. When Edmund Kemper killed his grandparents, he should have been kept behind bars forever, in my opinion. Instead, he made friends with his psychiatrists and was set loose on the world again. His juvenile record was eventually expunged. Jeffrey Dahmer showed troubling signs early on as well, but because he didn’t have a consistent caregiver, he didn’t get the help he needed. Reading this just churns my stomach. You’d always think that somehow others around them could tell. That they are generally gregarious and even likable make it even more scary. I’m lucky to have never met a serial killer (I hope) as I fear I’d be one of their gullible victims. I inherently believe in people’s goodness, so I find serial killers a hard category to get my head around. Thanks for commenting, Ula, and welcome to my blog! I hope to see you back here again. What is most troubling to me is that serial killers often prey on kind, helpful people (especially women). Most of Bundy’s victims agreed to assist him in some way. Kemper accidentally locked himself out of his car while a victim was still alive. He knocked on the car door, and he had done such a good job of controlling her that she actually unlocked the door! Instead of escaping, she assisted him in her own death. So sad. I’d be very suspicious of charming people who are mysterious about their whereabouts, especially if there are unexplained absences. Most of the women who were intimately involved with these men knew that something was wrong. Bundy’s girlfriend called him in as a suspect in the “Ted” murders. I wasn’t sure if I wanted to hit Like on this one, but it is definitely fascinating and informative. Creepy! I didn’t know that about John Wayne Gacy but It gave me nightmares for months after I read it. Maybe because I also hate spiders. Yep, definitely wasn’t a great portrayal of spiders either. I highly recommend “A Good Marriage.” It’s in “Full Dark, No Stars.” Every story in that book is fantastic. Yes very fascinating and terrifying. I have a serial killer in one of my WIP, let’s just say the research made life bleak. I believe it, Haneen. But it’s interesting subject matter, no? Now you should definitely watch supernatural. H.H. Holmes was a focus of one of the episodes. Serial killers are fascinating and terrifying. Our famous s. k. was Gerald Gallego. He and his wife were sick and twisted s.o.b.s. Hmm…haven’t heard of that one. Where are you from? When serial killers are discussed their intelligence is always brought up. In pop culture, serial killers are usually loners or hillbillies. In reality, most seem to live normal lives on the outside. It’s not until they are caught that we see how depraved they were. Anyway, I’d argue that you’d almost have to be intelligent to kill randomly without remorse because it requires a highly logical mind, a mind where empathy, if it exists at all, is relegated to a corner only to be used when it serves a purpose. Yeah, popular culture hasn’t done us any favours when it comes to telling us how to avoid serial killers. Even Ed Gein, who inspired the Texas Chainsaw Massacre, among other things, blended in fairly well with his little home community. People thought he was a “bit weird,” but of course only in hindsight. Good point about intelligence. Not to mention the intelligence necessary to carry out these crimes for so long without getting caught. I remember reading “The Stranger Beside Me” by Anne Rule many years ago. Gave me nightmares for weeks, but it also stirred up an interest in serial killers and a curiosity about how people come to exist so far outside borders of normal human behaviour. It’s a fascinating topic–hardly surprising that Stephen King has been inspired by it to write (possibly) two books. So much fodder for the dark side of the imagination. That book started Rule on a whole new career path. In a way, sitting next to Bundy was a very lucky break for her. And I agree about imaginative fodder! I hope these posts will inspire some great stories. Vincent Bugliosi is one of my favorite authors for this genre. Very captivating. I still think Manson may have killed a person or two that we don’t know about. He either sucked at it or didn’t like it and that’s why he made others kill for him. Let’s hope Georgeann didn’t suffer to greatly. I agree, Heather. Helter Skelter is a brilliant book. As for Manson, there are rumours that he might have killed one of the followers and another “groupie” who became a nuisance, but I still think he probably had someone else do it. He was too smart to get his hands dirty. Poor Georgeann. I’ll never forget her.